This Tramontina Steak Knife could be yours! A hot, juicy steak is one of the most satisfying meals you can enjoy. Whether you like yours flame-grilled on the barbeque or pan-fried to perfection, you need some decent cutlery to do your meat justice! That’s where the Tramontina Steel Steak Knife comes in. These knives are now available for only $9.90 with the purchase of any steak main meal in our restaurant. Limited to one steak knife per transaction. These knives make for a great gift of fill your cutlery draw for your next dinner party. Ergonomically designed for comfort and efficiency, these jumbo steak knives cut with ease. Using high quality stainless steel, Tramontina steak knives are known all over the world for their quality, great serration and tradition in knife manufacturing. The triple riveted handles ensure more durability, better balance and overall quality to your steak knife. Handles are made of a cured wood manufactured exclusively by Tramontina in Brazil. Knives are dishwasher safe, high-impact resistant and temperature resistant. Our steak menu includes Porterhouse, Petite Rump, Rump, Eye Fillet, Fillet Mignon and Rib Fillet. All served with your choice of sauce, chips or mash and salad or add vegetables for a small additional fee. 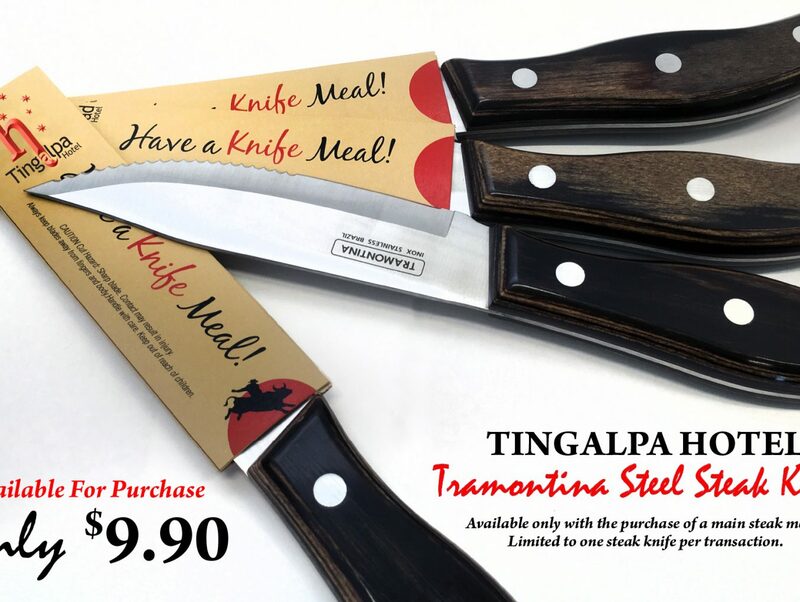 Simply purchase any one of these menu items to add this limited edition Tingalpa Hotel Tramontina Steak Knife for just $9.90.